Islandmagee’s Island Voices Choir are singing in perfect harmony after their local community centre received an acoustic makeover to the tune of £30k. The centre, located beside Gobbins HQ, is already home to Playaway Playgroup, craft and food fairs, carol services, quizzes, kids parties and fitness classes. This new makeover will allow the centre to be used for much more, as well as musical performances by the local choir sounding pitch perfect. Ald Gregg McKeen, chair of Mid and East Antrim Borough Council’s Economic Growth Committee said: “This is the first Village Renewal project across the line and we’re really delighted. Everything about this has been about the local community, from the ideas, the work timescales, the consultations and even the contractor who carried out the work is local. “This is the ethos behind Village Renewal, it helps local communities roll out improvements in their areas that benefit them. Groups have spent months consulting with locals and experts about their innovative ideas to boost their areas and special thanks goes to the Islandmagee Community Development Association. Without their commitment, energy and ideas the process would not have been the success it has been. I would also like to thank DAERA for their support under the Rural Development Programme, and all the contractors for keeping disruption to a minimum at the centre. Funding for the village renewal programme is distributed by Mid and East Antrim Local Action Group (LAG). 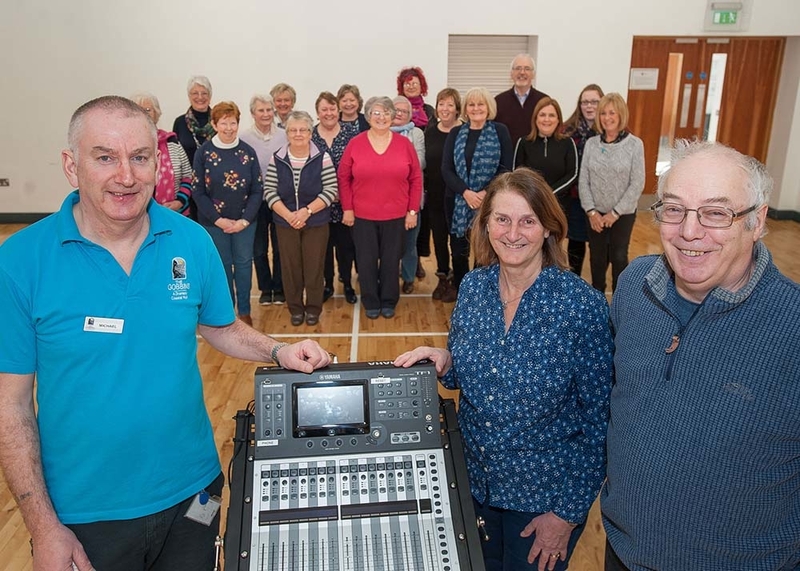 Photograph: Michael from the Islandmagee Community Centre alongside Hilary and Eric Bailey, with the Island Voices Choir enjoying their new sound system.